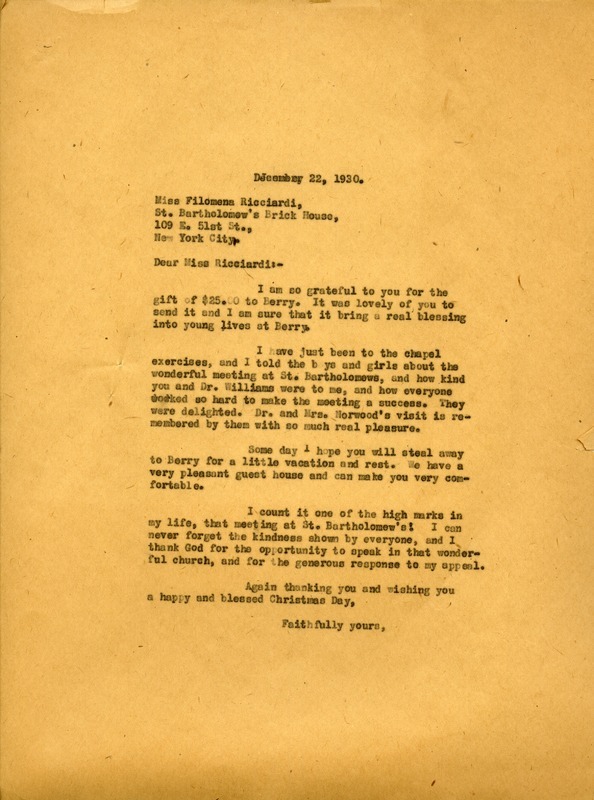 In this letter Martha Berry is thanking Miss Filomena Ricciardi for the donation of twenty-five dollars. Martha Berry also invites Miss Filomena Ricciaardi to come stay at the guest house at Berry. Martha Berry, “Letter from Martha Berry to Filomena Ricciardi.” Martha Berry Digital Archive. Eds. Schlitz, Stephanie A., Chelsea Risley, Jordan Brannen, et al. Mount Berry: Berry College, 2014. accessed April 22, 2019, https://mbda.berry.edu/items/show/13818.